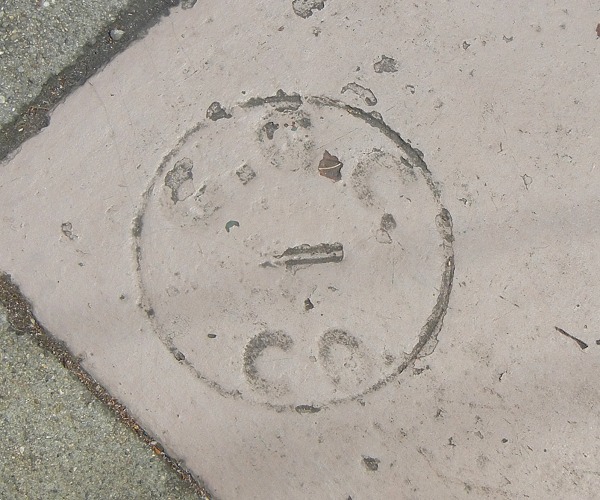 The peculiar round mark of the Golden Gate Construction Co. is so rare that I had to document this example, one of two at 5519 and 5527 Market Street. The company was in existence in the first decade of the 20th century. Another one is next to Lois the Pie Queen. This entry was posted on 7 October 2016 at 8:03 am and is filed under Undated examples. You can follow any responses to this entry through the RSS 2.0 feed. You can skip to the end and leave a response. Pinging is currently not allowed.